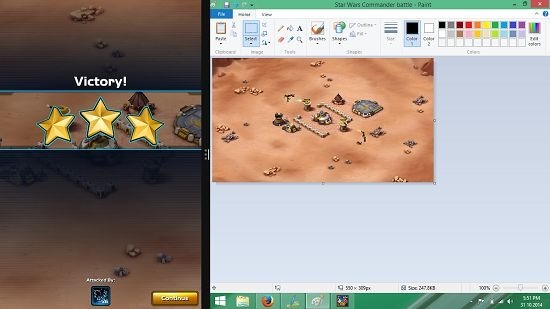 Star Wars: Commander is a free strategy game for Windows 8 and 8.1 where you aim to build an effective enemy base and counter enemy’s incoming attacks. Throughout the game you will be guided by holographic figurines at the bottom of the screen who will talk to you via means of sound as well as text. You can read their messages and act accordingly. 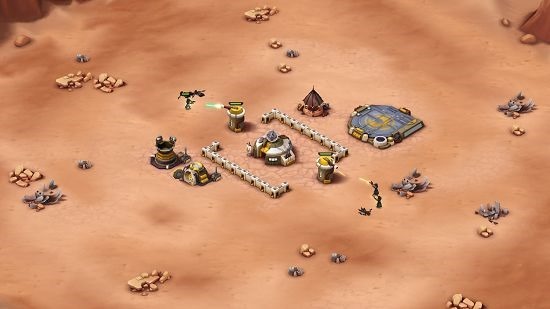 The game involves building up the attack and defense mechanisms for your base, including buying and placing turrets, etc. Overall the game is pretty fun to play and will keep you hooked. Star Wars: Commander is available for free from the App Store. When you launch the game, you will be shown a brief video screen wherein you will be told about what has actually happened and why you are doing what you are doing in the game. This game video is much like the opening credits to the game, and can also be skipped from the top right of the screen via the Skip button. 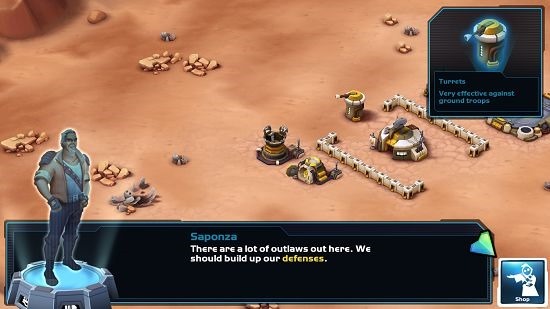 Once the skip button is pressed, you will be taken immediately to the gameplay screen where you will be greeted by a holographic talking image of Saponza who is your ally and detailed about your mission at hand. Throughout the game you will get messages from various enemies and allies and you have to act accordingly. The game shop is accessible at all times at the bottom right corner. You gain credits in the game by clicking on buildings which collect taxes, and also by winning battles from an incoming enemy. Below you can see the procedure for setting up a turret on your base. Simply click on the Shop icon, select the turret option and place it on your base by dragging it on your screen, and pressing the tick button on a green zone. Red zones are areas where you can’t place your buildings because of the land not being in your base area, or because of a building already being present at the spot where you wish to place it. You get attacked by enemies throughout the game, so always make sure that your defenses and attacks are up! A battle can be seen in the above screenshot. The game works well even in snapped mode, by adjusting the size of stuff on the screen to fit a smaller dimension. You can see the battle victory message in the below screenshot, and you can also see the fact that the game does in fact run well in snapped mode! 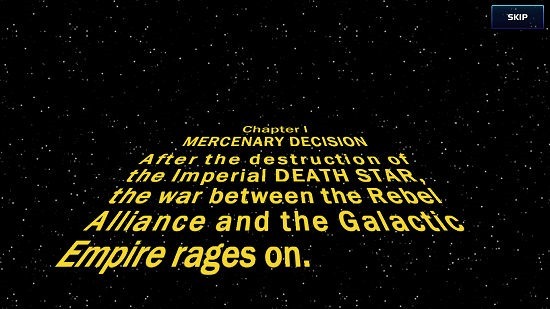 This concludes the main features of the game! Star Wars: Commander is a well designed game for Windows 8 and 8.1 which allows you to be strategic and aim for high scores at the same time. The game will keep you involved at all stages, and you will simply love it!